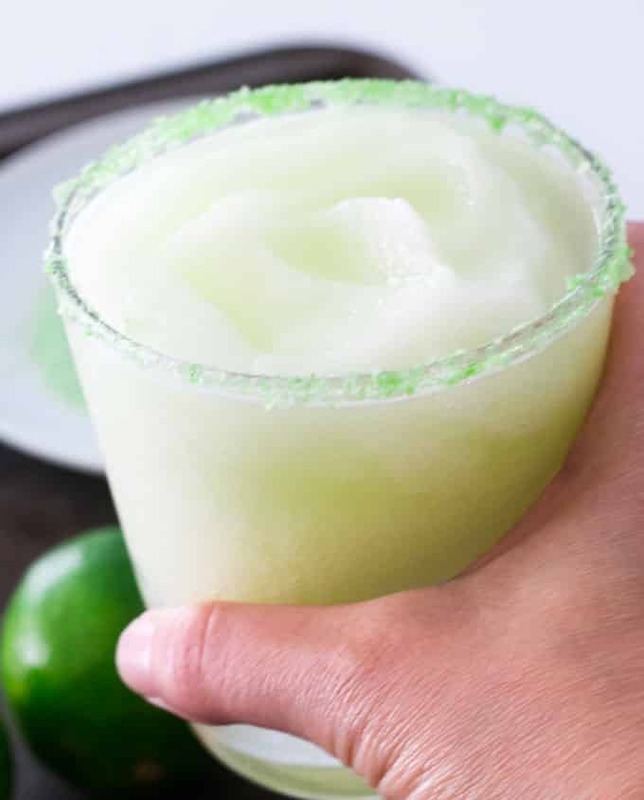 Any Margarita Lovers out there? I don’t know about you but there is just something about a margarita that lifts my spirits. EVERY TIME. I like margaritas in all shapes and sizes. 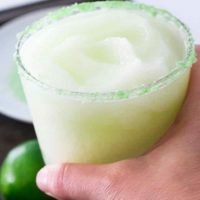 Traditional margaritas, fruit flavoured, spicy cucumber margaritas but in the summer there is nothing better than a batch of frozen whole lime margaritas. Its cold and refreshing yet it will make your lips pucker. ***This post includes affiliate links which means if you click on one of the product links I may receive compensation from the seller, at no additional cost to you. You can absolutely make a great margarita with just lime juice but I prefer making them with whole limes peeled. 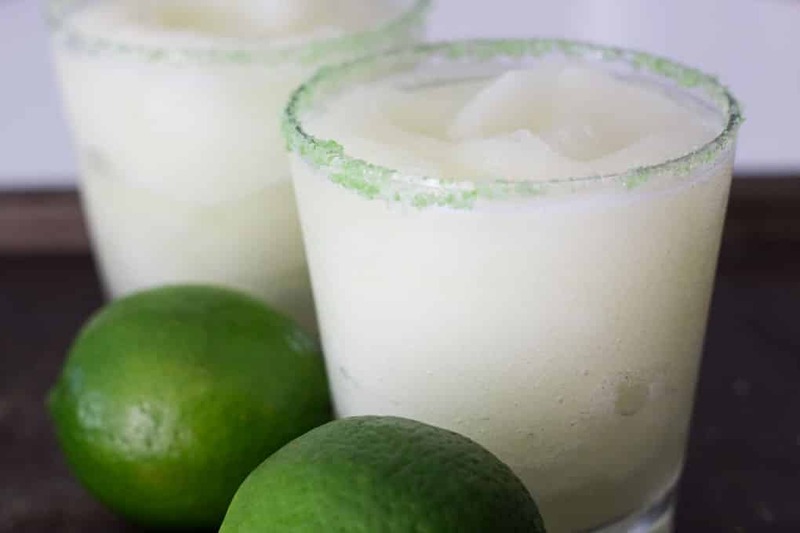 The great part about making them in the blender is that you can blend down the whole lime and get all the flavour out of them plus you can make them in big batches to serve up for your friends. Peel the limes, add Tequila and Triple Sec and a little bit of simple syrup and a whole lot of ice and blend away. If you don’t have simple syrup handy then try this easy trick that will do in a pinch. Add equal parts water and white granulated sugar in a mason jar, screw on the lid and shake away. Shake, shake, shake until the sugar dissolves. This is way easier than going down the boiling recipe path. If you have a bit more time you can do this in the blender on the heat setting and then allow to cool. Or, you can easily find simple syrup in most grocery stores or on amazon. I have always been a sucker for a glass rimmed in sugar or salt. I’m currently enjoying this Margarita Lime Salt. It makes my lips pucker just the way I like it. I also enjoy flavored sugars – try one of these ideas from Wide Open Eats. So now that you have your margarita in hand, what do you pair with it? For me, it’s Chips + Salsa + Guacamole! My current favourite salsa is this restaurant style salsa made with fresh cilantro – so easy to make and customizable to your preferred level of heat. Lip puckering good frozen margaritas made with whole limes. Peel limes and add to the blender with Tequila, Triple Sec, Simple Syrup and add 3-4 cups of ice to start. Blend until limes and ice are broken down and mixture is well blended. If required, add more ice and blend again. (Optional) Rim glasses in salt. Pour margaritas into glasses and enjoy.